Every age manifests itself by some external evidence. In a period such as ours when only a comparatively few individuals seem to be given to religion, some form other than the Gothic cathedral must be found. Industry concerns the greatest numbers-it may be true, as has been said, that our factories are our substitute for religious expression. 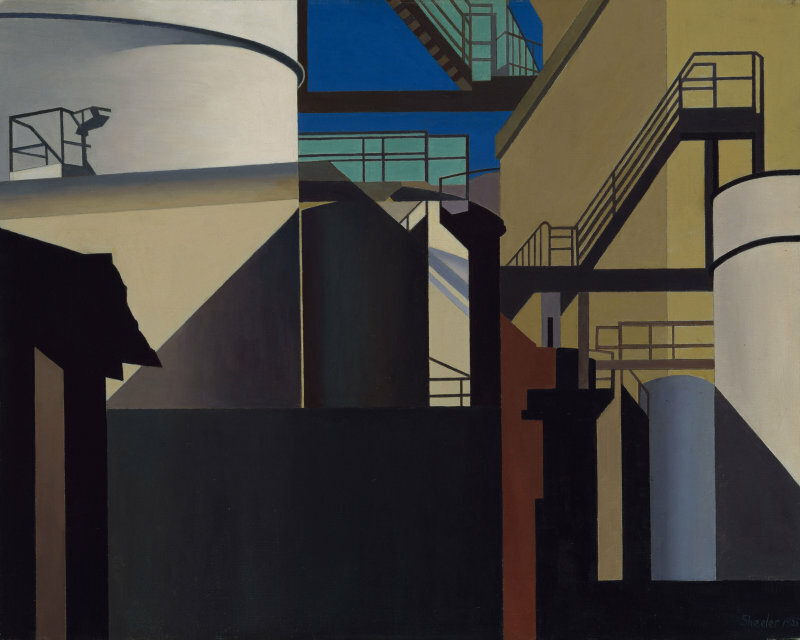 In much of his photography and painting, Charles Sheeler (1883-1965) equated the sheer mass and space of modern industry with the grandeur of medieval cathedrals. He saw in both of these environments, spaces that bring awe to the common man. These places often make one feel small and insignificant and in the presence of a powerful entity, one that dwarfed one’s own strength and power. I think his work accurately showed the transition of our spiritual adoration from the religious to the corporate structures. It seems to me that we have bestowed a new sense of reverence on corporations, believing that they are some sort of savior and protector that will always act in the best interest of the many. When we speak of policy now, we don’t speak about how we can help people in need, we speak about how we can help large businesses. The idea there is that if they do well the benevolence they show in their hiring and acquiring will naturally take care of all ills. If you look at that from a historical perspective, that’s not much different than the place occupied by the church throughout the ages. I know that’s not a new observation but it seems more and more obvious in recent times as so many common people have come to view capitalism in almost religious terms, with corporations deserving our veneration and protection. 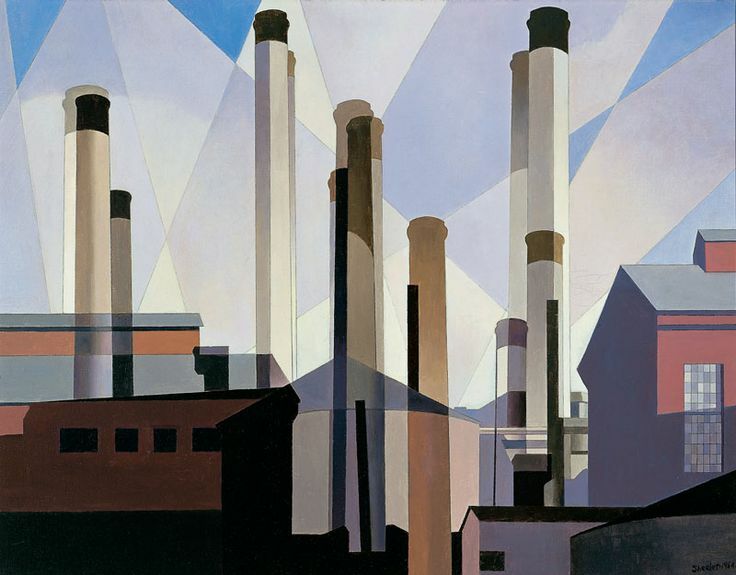 And it makes me wonder if Sheeler was right, that the factories and corporations have become our substitute for religious expression? What will future generations see as the external evidence of our age? Will our perceived legacy be little more than the spaces of large corporate campuses and huge distribution centers? Is that the extent of our reach now? Just thinking a little this morning. 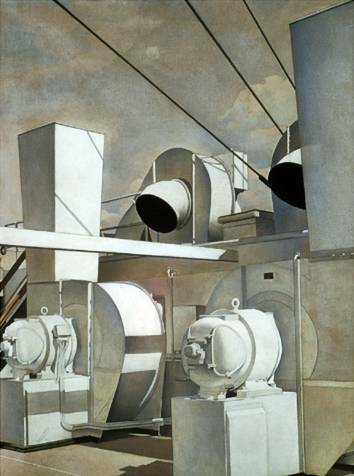 Anyway, here are some other Sheeler paintings. It’s been quite a transition in our country, from Puritan days, when an extra shilling profit was considered sharp dealing and usury, and won you a day in the stocks, to the current reverence for capitalism. Karl Marx recognized the virtues and power of capitalism, and while talking about its destruction, also talked about its resilience. When people treat something as sacrosanct, and can’t rationally analyze economic issues, they’re easy victims. These paintings, with everything clean and perfect, as you say, giving a sense of grandeur to smokestacks and storage tanks, reminds me of a movie with Cate Blanchett as Elizabeth I, adding layers of white makeup, to transform herself into a religious icon, The Virgin Queen. I’m enjoying your art lessons. Thanks, Robert. The makeup of Elizabeth I is a great analogy, one that I overlooked. Three paintings: three ways of portraying light. 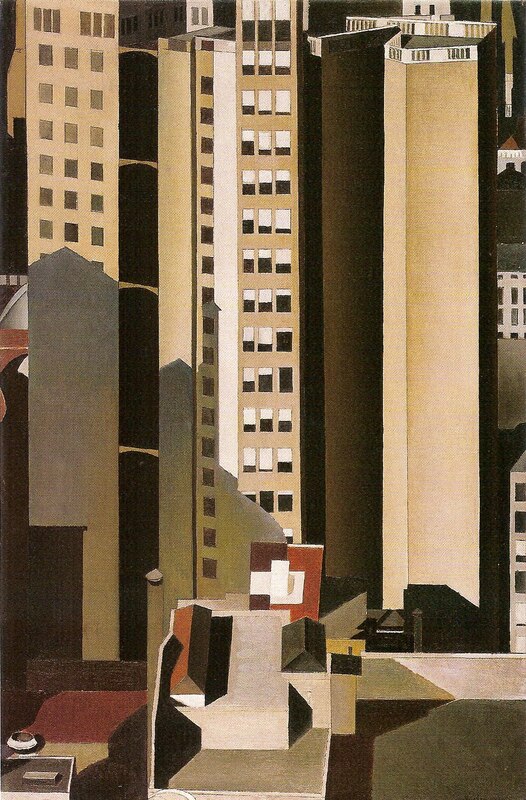 In the first, the reflection o the clouds in the machinery softens the image. The sharply angled rays of the second seem to suggest that even the light was manufactured. And in the third, marked more by shadows than light, the few instances of light seem to suggest that even in the darkest environment, a ray or two will get through. It’s a nice set of examples.